Opened to navigation in 1959, the St. Lawrence Seaway part of the system has moved more than 2.5 billion metric tonnes of cargo in 50 years, with an estimated value of more than $375 billion. Almost 25% of this cargo travels to and from overseas ports, especially Europe, South America, the Middle East, and Africa. From Great Lakes/Seaway ports, a multi-modal transportation network fans out across the continent. More than 40 provincial and interstate highways and St. Lawrence Seaway, which lift/lower ships 99.4 metres (326 feet); and v	one lock at Sault Ste. Marie, Michigan, which lifts/lowers ships 9.2 metres (30 feet). Three distinct vessel-operator groups serve the waterway. These include American and Canadian domestic carriers transporting cargo between ports within the system, and international ocean-going vessel operators that operate between ports within the system and ports located overseas. Every year, more than 160 million metric tonnes of raw materials, agricultural commodities and manufactured products are moved on the Great Lakes–St. Lawrence Seaway System. Dominant cargoes include iron ore for steel production, coal for power generation, limestone and cement for construction, and grain for both domestic consumption and export. The Port of Thunder Bay is located at the head of the Great Lakes/St. Lawrence Seaway System. A one- way voyage through the Seaway to Thunder Bay takes about five days with ships 228.6 metres in length, 23.8 metres in width with a draught of 8.2 metres being elevated some 180 metres through 16 of the most efficient locks in the world. The Port of Thunder Bay is experiencing very high levels of traffic at the moment. In May, it had its strongest month since the 1990s, handling more than 1.5 million tonnes of cargo during the month — the largest tally in any single month since 1998. Grain shipments were particularly strong: over 1.3mt (million tonnes) of grain were exported through the port’s eight grain elevators. Despite record-breaking ice conditions that set back the port’s opening date by an unprecedented four weeks, the port managed to make-up and even surpass last May’s year-to-date grain volumes. Other cargoes with strong monthly comebacks included coal and dry bulk. Vessel calls for the month were up sharply over last year and included 26 foreign ‘saltie’ vessels — the most in any single month since 2000. Salties transported a third (33%) of the port’s grain during the month, much higher than the five-year average of 15%. In June, the Port of Thunder Bay experienced its second consecutive month of very strong grain shipments, with 965,000 tonnes loaded onto outbound vessels at Thunder Bay’s grain elevators during the month. Compared to the same month last year, the port more than doubled its grain output, with significant increases in vessel calls by both lakers and salties. Year-to-date grain shipments are up 35% over 2013, and 18% over the five-year average. Overall monthly tonnage for the port surpassed 1mt for the second month in a row, with potash and bulk commodities also seeing increases over 2013 volumes. The last time both May and June shipments were over 1mt was 2001. Thunder Bay Port Authority expects shipments to remain strong through the summer as Western Canada’s record grain harvest from 2013 continues to move the market. Lake Carriers’ Association (LCA) represents US-flag vessel operators on the Great Lakes. The Association’s 17 member companies operate 57 US-flag self-propelled vessels and tug/barge units (lakers) ranging in length from 494 to 1,013.5 feet. These vessels can carry more than 115 million tonnes of cargo in a year. Iron ore, limestone and coal are the primary commodities carried by LCA members. Other cargoes include cement, salt, sand and grain. The vast majority of cargoes carried by US-flag lakers move between US ports, in what is commonly referred to as the Jones Act trades. In promoting the common interests of its members and their customers, LCA places special importance on legislative and regulatory matters. To facilitate a broad-based understanding of US-flag shipping on the Great Lakes and its role in the nation’s economy, LCA compiles statistical information on the volume of cargo movement, both in US-flag lakers and from major Great Lakes ports in the United States and Canada. In this article, details of this year’s coal, iron ore and limestone movements are shown. America can take pride in the US-flag Great Lakes fleet. No other maritime nation has assembled such a modern, productive fleet of self-unloading vessels.The thirteen 1,000-footers flying the US flag on the Lakes are longer than most of the grandest ocean liners. So technologically advanced are these vessels that they can discharge 70,000 tonnes of iron ore or coal in 10 hours or less without any assistance from shoreside personnel or equipment. The industry’s carbon footprint is the smallest of any of the major transportation modes. As of 11 July, the rise in Great Lakes water levels has yet to translate into full loads for the US-flag freighters moving iron ore, coal, limestone, cement and other cargoes. Vessels continue to routinely leave port with less than a full load on board. The largest iron ore cargo moved by a US-flag laker through the Soo Locks in June totalled 69,576 tonnes. The record iron ore cargo for the ‘Head-of-the-Lakes Trade’ is 72,300 tonnes and was carried in 1997, a period of near record-high water levels. The deepest draught ever recorded for a transit of the Poe Lock is 29’03” in 1986. If a 1,000-foot-long US-flag laker could transit the lock that deep today, the vessel would be carrying 72,727 tonnes. Vessels in the coal trade continued to depart loading docks with capacity to spare. The largest coal cargo through the Soo Locks totalled 67,992 tonnes, nearly 5% less than the record of 70,903 tonnes. Vessels in the short-haul trades below the Soo Locks likewise are still unable to maximize their carrying capacity. A river-class laker that delivered 13,000 tonnes of limestone to a dock along the Saginaw River was still 3,000 tonnes short of its rated capacity. A 14,000-tonne cement cargo discharged in Detroit and Cleveland represented only 80% of the vessel’s rated capacity. The US Army Corps of Engineers estimates approximately 18 million cubic yards of sediment clog Great Lakes ports and waterways and pegs the cost of dredging that volume at more than $200 million. The Harbor Maintenance Trust Fund, the depository for a tax levied on cargo to pay for dredging, has a surplus of more than $8 billion. US AND CANADIAN GREAT LAKES VESSEL OPERATORS ANNOUNCE JOINT BALLAST WATER PRINCIPLES On 11 June this year, Lake Carriers’ Association (LCA) and Canadian Shipowners Association (CSA), the trade associations representing US- and Canadian-flag vessel operators on the Great Lakes, released the five principles they believe should guide the US and Canadian governments as they regulate the ballast water on their vessels. The five principles should govern their vessels operating in the Great Lakes, St. Lawrence River, Gulf of St. Lawrence, Canadian eastern and Arctic waters to the limit of the Canadian exclusive economic zone (Operating Area). Operating Area should continue implementing Best Management Practices as they have since 1993, and not be required to install ballast water treatment systems. 2.Any Rule must recognize the unique operating requirements and diversity of environmental conditions faced by Domestic Vessels. The IMO rule should not be the basis for governing a ballast water treatment rule for DomesticVessels.The IMO rule does not recognize the unique operating requirements and diversity of environmental conditions faced by Domestic Vessels within the Operating Area. The cost of compliance given these challenges and constraints could impose substantial economic harm. Furthermore the IMO rule does not recognize the difference between the risk of AIS transfer versus the risk of AIS introduction by foreign vessels. be endorsed as a solution for Domestic Vessels. The AMS program was only intended to be as protective as salt- water exchange/flushing for Foreign flag vessels and therefore must not be viewed as an endorsement of any foreign type- approved ballast water treatment system for use by Domestic Vessels. 4. LCA and CSA Members have a common interest to advocate for a single rule in the Operating Area to Governments and Regulators. LCA and CSA Members agree to jointly and severally advocate for Canadian Ballast Water regulations for Domestic Vessels that incorporate the principles espoused herein and advocate for recognition of such Canadian regulations by the US Coast Guard and Environmental Protection Agency. 5. LCA and CSA Members have a common interest to promote ballast water research and technological evaluation aimed at the unique requirements of Domestic Vessels operating in a unique environment. Participation in shared research and evaluation is a priority of both the LCA and CSA. These efforts shall be aimed at determining the potential risk of AIS transfer from the ballasting operations of Domestic Vessels within the operating area and to assess ballast water treatment technologies for the development of best management practices and to assess the feasibility of such technologies for domestic vessels. vessels in the Operating Area (Domestic Vessels). There are a multitude of jurisdictions that exercise authority over the bi-national waterway within the Operating Area. Domestic Vessels should operate under a uniform single standard or compatible set of national rules that are fair and rationally based, that result in requirements that are technically and operationally achievable, considering vessel age, type, and operating characteristics, and are economically feasible resulting in a positive benefit to cost ratio. Since treatment systems do not currently exist and are not expected to exist in the near future, Domestic Vessels operating exclusively within the Operating Area should continue implementing Best Management Practices as they have since 1993, and not be required to install ballast water treatment systems. 3.The US Coast Guard’s Alternative Management System cannot be endorsed as a solution for Domestic Vessels. The AMS program was only intended to be as protective as salt- water exchange/flushing for Foreign flag vessels and therefore must not be viewed as an endorsement of any foreign type- approved ballast water treatment system for use by Domestic Vessels. With over 30 years of experience in cargo handling and inland logistics, Rideau Bulk Terminals Inc. is known for its dependability. “For one client, we run a truck service seven days a week, 24 hours a day to keep raw materials flowing to his production site. He told us he’d shut down within 12 hours if we don’t deliver on time,” says Alain Lefebvre, General Manager at Rideau Bulk. As an example, Rideau Bulk handles approximately 1.5 million tonnes of salt every year, and provides vessel loading and unloading, stockpiling, storage, and truck loading services for the three major salt companies serving Eastern Canada. At its inland terminals, Rideau Bulk manages road salt distribution for local de-icing operations, large and small. township and various levels of government have been working for the last two years on a $35 million expansion of the primary wharf, as well as new berthing and storage areas. The port was already well equipped to handle grain and other bulk commodities, and Rideau Bulk is looking forward to bringing new types of cargo to town. In addition to considerable storage space throughout its network, Rideau Bulk has trucks and quality equipment at its port terminals, such as loaders and a new, fully automatic conveyer stacker for charging vessels and stockpiling bulk commodities up to 70 feet. 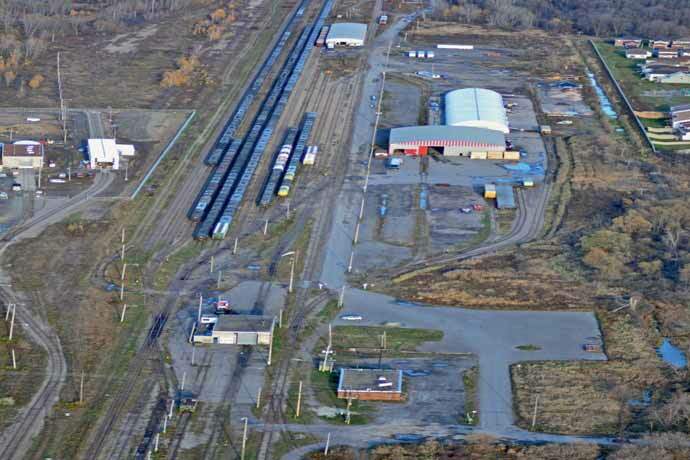 At its inland terminal in Ottawa, which is served by CN Rail, Rideau Bulk handles general cargo, landscaping supplies, and forest products, including chipboard panels and pulp for local mills. It also delivers lumber to local Rona stores, moves 100–150 cars of roof shingles per year, and has worked closely with its clients to double the amount of fertilizer it distributes to farming co-ops in the Ottawa Valley. Whether by vessel, by rail, or by truck, Rideau Bulk Terminals has the answer! Bulk operations at the Georgia Ports Authority’s (GPA) Marine Port Terminals in Brunswick are currently leased and operated by Logistec USA Inc., the American subsidiary of Montreal-based Logistec Corporation. With a deep draught of 36 feet at the terminal, Logistec handles approximately one million tonnes of cargo annually and expects continuous growth in its local bulk operations. In partnership with the GPA, Logistec recently invested over $15 million in upgrades to the 75-acre facility to increase its capacity for handling a wide variety of general and bulk cargo. This included dredging, pier infrastructure improvements, new warehouses, renovations to existing storage facilities, and a new cargo receiving and load out system for exporting biomass material. Logistec is able to economically load wood pellets intended for power plants in the United Kingdom, Scandinavia, and other European markets. Since 1997, Logistec has handled a variety of cargoes in Brunswick, such as wood pellets, peanut hull pellets, salt, aggregates, dry and liquid fertilizers, perlite, and animal feed. Logistec is known for its expertise and professionalism, providing specialized cargo handling and value-added logistics services to marine and industrial customers. Fednav is Canada’s largest ocean-going dry-bulk shipowning and chartering group. For 70 years, it has been delivering practical, innovative maritime transportation solutions as a pioneer in the international shipping industry.With offices on four continents and a reputation built on a commitment to customer care and reliability, Fednav is a leader in international shipping to and from the St. Lawrence River and the Great Lakes, as well as the Canadian Arctic, boasting the world’s largest fleet of ice-class bulk carriers. Now in its 70th year, Fednav continues to demonstrate its commitment to Lakes development. It recently invested in 12 Lakes-suitable, highly efficient vessels for delivery in 2015 and 2016. Additionally, FALLine, a company division, this year celebrates 55 years operating a continuous general cargo liner service from Europe to the Great Lakes. Federal Marine Terminals, Inc. (FMT) has been handling cargoes in the Great Lakes and St. Lawrence River and along the East and Gulf coasts since 1960 and is recognized as an industry leader servicing breakbulk, bulk, specialized, and general cargo needs. In a world of continuously evolving commodity markets, Quebec Stevedoring Company Ltd (QSL), based in Quebec City, Canada, is adding a new ‘feather to its cap’. Through the first six months of 2014, QSL has conceived, designed and is building a state-of- the-art storage and shiploading facility for the export of wood pellets in bulk to the ‘green energy’-hungry nations of Europe and beyond. In collaboration with Rentech Inc., a major North American producer of wood pellets with production facilities in the Eastern United States and Canada, QSL has become an integral part in the logistics chain helping to bring cleaner energy to the market in the form of sustainable biomass pellets to fuel the low-carbon economies of Europe. With a total capacity of 75,000 tonnes of indoor storage in the form of two domes located at Wolfe’s Cove, a sector of the Port of Quebec, the way has been cleared for developments in Eastern Canada that will assist in the creation of a new value-added product for the local forestry industry. The emergence of industrial wood pellet production and export helps offset the loss of jobs in the pulp and paper sector of Eastern Canada, while also improving the economics of other wood product industries. The second half of 2014 will be very busy as this new infrastructure ramps up for deliveries overseas into the winter of 2014 / 2015. Before the actual construction started this new opportunity went through an extensive risk-assessment process. Through an elaborate research project, QSL learned how the handling of wood pellets was done in the past and how the methods have improved. What were the impacts, during each part of the operation, such as; dust and noise pollution and even spontaneous combustion? The findings were combined with information from similar projects either currently on the drawing board or in the construction phase, and through other bulk material handlers whose products have similar characteristics. All precautions currently available within the material handling equipment and technology industry worldwide were brought together to make this terminal a global reference for the handling of wood pellets. The highest risk prevention technology has been put in place to ensure the compliance with the top security standards. One of the most important systems integrated into the new construction will replace all of the air within the domes with a non-flammable gas at the first sign of conditions that could lead to ignition. This will remove the oxygen necessary for combustion and avert events that have been witnessed elsewhere in the handling of wood pellets and other biomass based products. Great efforts were made to find the safest solutions that were also the least intrusive in terms of design. QSL is very much aware of its location near to the historic centre of picturesque Quebec City and they have worked very hard to create both an efficient operations facility and the most visually appealing structure. The total private investment for this state of the art terminal is approximately 25 million dollars. The wood pellets will arrive by train, be fed to an underground conveyor system for transfer to the storage domes. After the safe transfer and storage of the pellets, inventory will be accumulated and then loaded on either Handymax or Panamax-type vessels. With 12.2m of depth at low tide at the wood pellet terminal, shipments of 60,000 tonnes should not be uncommon, depending on the vessels loaded. This new activity will be added to the other products handled within QSL, and its affiliates. Over 20 different items are handled within the bulk infrastructure such as raw sugar, rock salt, cement, iron ore (pellets, chips and fines), coal, grains and meals and mineral concentrates. The fact that the Port of Quebec is the last deep water port before entering the St- Lawrence Seaway and Great Lakes system and can be considered the gateway to and from the central section of North America means it is an ideal choice for both bulk commodities and specialties imported and exported. comprehensive services are offered to build long term relationships with QSL’s clients. Open year round, the port of Quebec offers world-class port and marine services, and can accommodate vessels with draughts of up to 15m. All terminals have efficient rail and road connections. The port is located 1,300km from the Atlantic Ocean and less than 200km from the beginning of the St. Lawrence Seaway, giving easy access to the Great Lakes and Mid-west markets. A total of 25mt are handled annually and approximately 1,000 vessels (cargo and cruise ships) dock year round. The Port of Quebec is composed of 15 different terminals (public, single product, multi-commodities, private and dedicated terminals). Commodities such as iron ore (fines, pellets and chips), a variety of concentrates, grains, chemicals, and petroleum products, fertilizers, sugar, cement, scrap metal, coking coal and coal are transshipped in tremendous volumes every year.